Jim McIntyre`s first match officially in charge at East End Park ends with a narrow 0-1 defeat to St Johnstone. A missed penalty by Mark Burchill does not help the cause between these two closely matched sides. With Calum Woods suspended Jim McIntyre had to make some changes to this weeks line up with notably the first game of the season for Greg Ross returning from serious injury. Paul Gallacher was in goals with Scott Thomson at right back with Wilson replacing him in the centre alongside Harris and with on loan Murphy playing his last game for the Pars. Ross was playing on the righthand side of midfield with Darren Young back in the side partnering Simmons in the centre and Morrison on the left. The established pairing of Burchill and Hamilton up front. The Pars had started the game brightly and Hamilton had a great lobbed effort in the first couple of minutes that just went past the post. A minute later Burchill was almost through on Main but the experienced keeper clattered into the striker in clearing the danger. 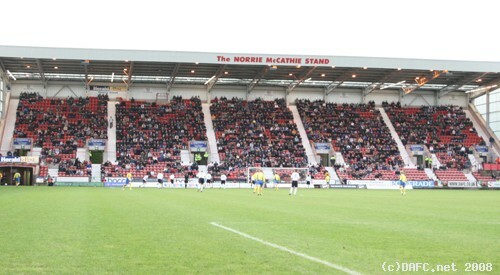 The Pars had a free kick in 8 minutes that Scott Morrison took. His shot cleared the St Johnstone wall but Alan Main managed to save low at this left post to deny the Pars the opening goal. Some great play by Jim Hamilton feeds the ball through to Burchill running in on Main and as he knocks the ball past the keeper the striker tumbles and referee infuriates the travelling support by pointing at the spot. Burchill himself takes the spot kick but manages to hit it miles over but perhaps a little bit of justice was done. Scott Thomson then has a chance to take a free kick in 13 minutes but his shot was over. St Johnstone threaten for the first time in 18 minutes as MacDonald hits a good shot just wide. A few minutes later Milne also shoots over after picking up the ball from a poor clearance by Wilson. Paul Gallacher is a renowned shot stopper and in 23 minutes he made an outstanding save from Sheerin. This was a class save, not only was the shot hit with power but it moved in the air and Gallacher saw it late as it came though a crowd of bodies in front of him. Superb! The Saints had weathered the Pars early storm and were slowly getting themselves back into the game. 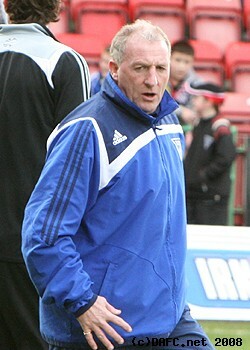 A free kick in 31 minutes was blasted against the Pars defensive wall. Back up the other end Burchill tried a similar lob from the left that just went past Main`s left hand post. The Saints fans were giving Burchill pelters everytime he got the ball but the Pars fans were equally irate at the antics of loan signing (from Falkirk) Liam Craig who twice went down and saw John Underhill wave play on. Just as halftime approached the Saints scored what turned out to be the winner. The Pars lost possession on the edge of the St Johnstone area and as the Saints broke quickly with Milne who was wide right with Scott Wilson charging down on him. Dinger instead of going through the guy tried to do the right thing and held him up but Milne cut inside fed the ball to Jackson who slid the ball past Gallacher who had come off his line to meet him. Half time 0-1. The Pars had taken off Darren Young at half time and brought on Kevin Harper. Harper was on the right and Ross went to centre midfield with Simmons. Harper won a corner right away but a poor cross by Morrison was easily cleared. The visitors had a great chance to increase their lead in 54 minutes as Craig found himself alone on the left with Nipper nowhere to be seen but he wasted the chance by blasting over. Greg Ross was subbed in 58 minutes with the boss bringing himself on. Rutkiewicz was booked for persistent fouling in 60 minutes. A good cross by McIntyre from the left saw Hamilton bring out a great save from Main. That was followed by another Pars corner with Jim Hamilton heading against the bar. Harper was causing a lot of problems on the right. He then hit a long free kick from the left that missed everyone as it went out for a bye kick. Nipper then found himself in the inside left position deep in the Saints 18 yard area but his turn and shot was saved by Main as the Pars were increasing the pressure looking for the equaliser. Murphy was booked in 73 minutes for a wild lunge and that was followed by a brilliant tackle by Scott Wilson almost on the edge of his own 6 yard area giving away a corner. St Johnstone had a couple of shots resulting from the corner that were blocked. Harris was subbed in 76 minutes with Crawford coming on as the Pars go to a 3:4:3 formation looking for the deserved equaliser. Stephen Simmons had a great chance as he burst through from the right but chose to shoot just over instead of squaring to his strikers in the middle.